The hex keys in this 22 piece SAE & metric set are made from premium S2 steel for superior durability and corrosion resistance. Gray hex keys deliver up to 33% more torque than ordinary hex keys. Backed by Gray Tools worry-free lifetime warranty. Contains sizes: .050", 1/16", 5/64", 3/32", 7/64", 1/8", 9/64", 5/32", 3/16", 7/32", 1/4", 5/16", 3/8", 1.5, 2, 2.5, 3, 4, 5, 6, 8, and 10mm. The Husky 18-Piece SAE/Metric Non-Slip Hex Key Set features keys made of alloy steel for greater strength and durability. The tips have non-slip groves in both ends of the keys designed to increase the grip on severely rounded fasteners. Simply apply pressure while turning the key to grip into the corners of damaged fasteners. 22 Piece Sae/Metric Long Arm Hex Key Set The hex keys in this 22 piece SAE & metric set are made from premium S2 steel for superior durability and corrosion resistance. Gray hex keys deliver up to 33% more torque than ordinary hex keys. Backed by Gray Tools worry-free lifetime warranty. 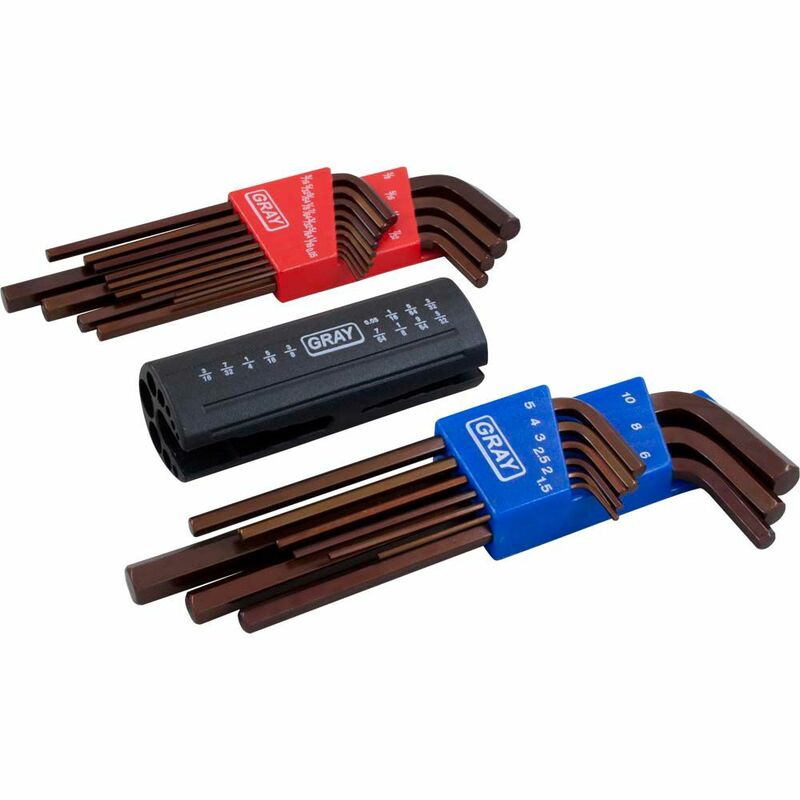 22 Piece Sae/Metric Long Arm Hex Key Set is rated 5.0 out of 5 by 1. Rated 5 out of 5 by 10thougrind from Awesome set of hex keys Ordered mine online and had it shipped to a store for pick up. Fast shipping and free!! Excellent product!! As a toolmaker I use this daily and love it.